This is the largest collection of U. F. Grant illusions and illusionettes every assembled. It took Devin Knight several years to compile this collection. 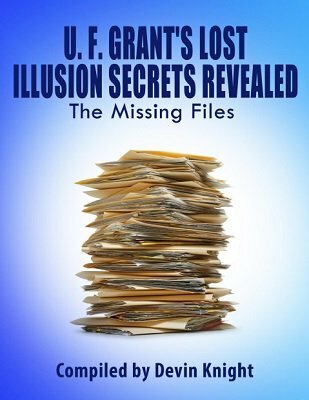 Grant wrote a few books on illusions such as: 15 Great Illusions , Chinese Magic and Illusions , Modern Levitations , Victory Carton Illusions , Grant's Illusion Secrets , and many others. However, most of the illusions in this PDF were not included in those manuscripts. Over the years, Grant sold many manuscripts that just contained one illusion along with building plans in most cases. (Some of these were released by Percy Abbott in his catalog without credit to U. F. Grant.) This compilation is a collection of those plans released by Grant and also in the early Abbott Magic catalogs. Most of these plans are near impossible to find nowadays and most of the ideas and plans will be new to the majority of magicians. The manuscripts have new typeset, corrected errors and added photos. Included are scans of the ads for some of these illusions and illusionettes. The scans are interesting in themselves, although many are from old and yellowed magic catalogs. A must read for any U. F. Grant fan as you will learn secrets you didn't know. 1st edition 2017, 172 pages.